Page 2 of Law of the Riverside is up. Ald sets foot on a new continent and takes a stroll down Iniquity Row. 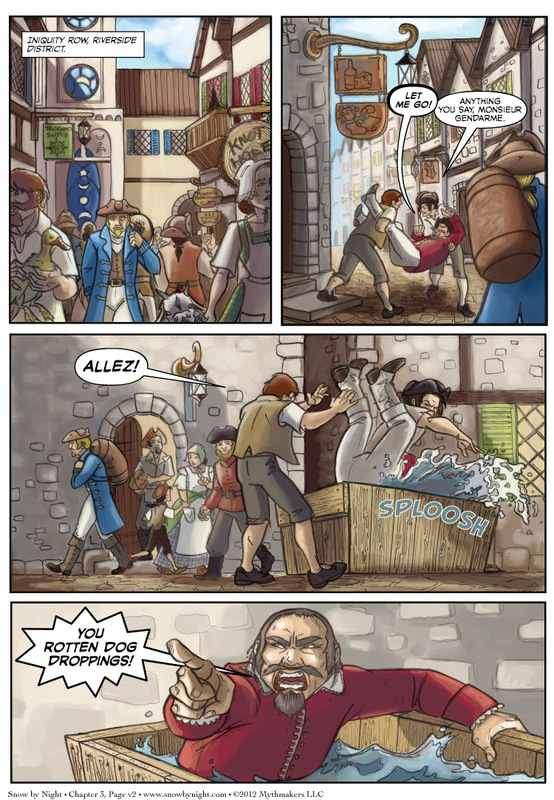 To see a peek of how Ald reacts to the street theatre he encounters, vote for Snow by Night on Top Web Comics. I owe you all an overdue convention report from Katsucon. Brittany and I were well placed in the Artist Alley, right across from Chris Flick of Capes & Babes. We had Team Tamuran on the other side of our square. Jen of LaSalle’s Legacy wanted part of the action and moved down to join us on Sunday. We also got to hang out on Saturday night with Robyn and Andrew of Technoangel Studios. One of the highlights was joining Chris for a panel on “Running a Webcomic on a Shoestring.” I had a great time with it, but it does require more than shoestring. It also takes Scotch tape and picture wire.